This bundle includes Canon Powershot SX520 HS camera, AC Power adapter (ACK-DC40), and inPhoto ID PS software. This is a professional and still affordable solution. The average cost is approximately 500 USD. 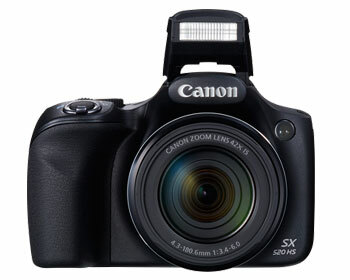 Canon Powershot SX520 HS camera. Canon SX520 HS camera has no possibility of a direct connection. 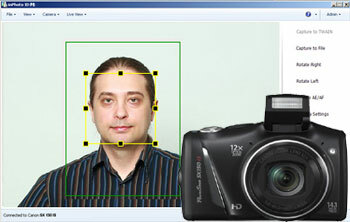 The camera uses NB-6LH format batteries. You will need to buy AC Adapter kit including NB-6LH format coupler. 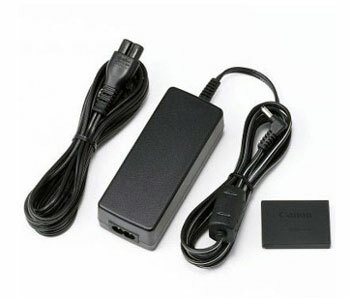 The adapter kit is used for permanent AC power supply of your camera. Using adapter kit you will not need to change camera batteries from time to time. The permanent AC power supply tremendously improves the work flow comfort and effectiveness. Insert the coupler as shown. Connect the adapter to the cameras: open the cover and insert the adapter plug fully to the camera.